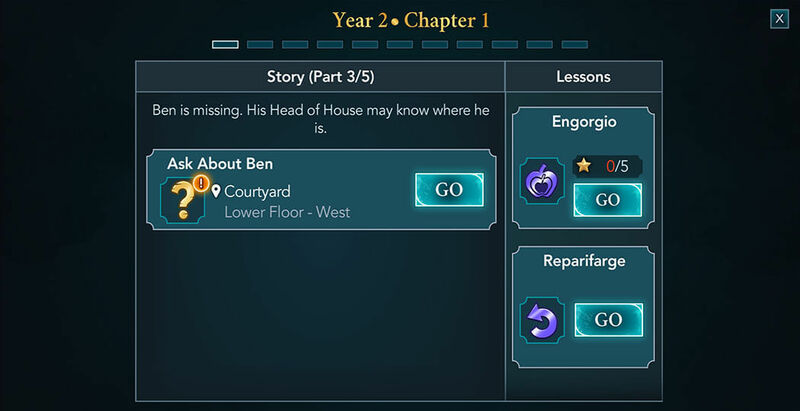 Hello everyone, it is time to start Chapter One of Year Two of our Magical Journey Walkthrough for Harry Potter: Hogwarts Mystery. In the previous year, we accomplished many great things. We met a lot of new friends, learned many important lessons, and most of all, we got some clues and information about the Cursed Vaults. That is a good start for finding out what happened to Jacob, and hopefully, this year will shed some light on that mystery. So, let’s get right to it and continue this amazing adventure. 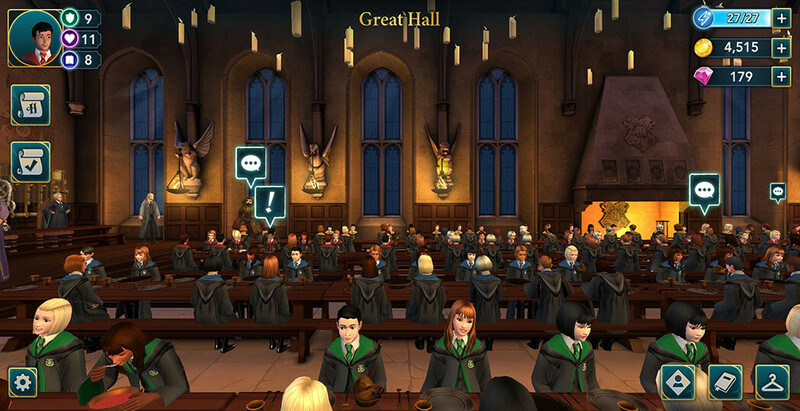 Your first task will be to attend the welcoming ceremony at the Great Hall. You’ll immediately notice that several characters have speech bubbles above them. Tap on those to see what they have to say to you. Afterward, tap on the exclamation mark to start the conversation with Rowan. He’ll ask how you spent your summer holidays. You can answer in three different ways. Each of those answers will award you with five points in a different attribute, so pick one to your liking. 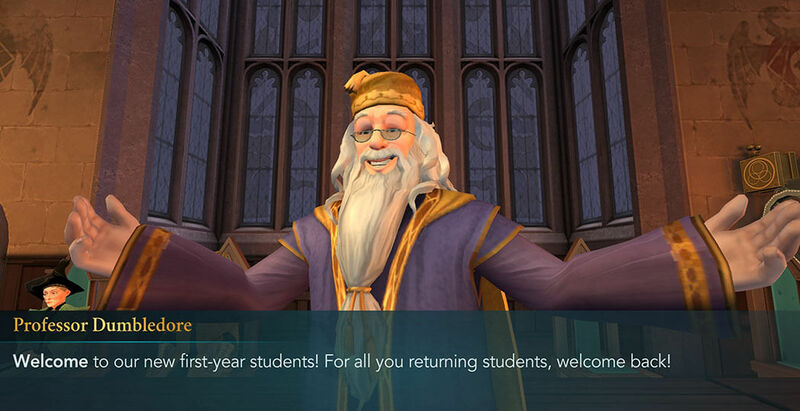 After a bit of talking with Rowan, the Headmaster will hold his welcoming speech. Afterward, you should check on Penny Haywood. Tap on the exclamation mark to proceed. After greeting her, you’ll realize that Ben Copper is missing. Apparently, no one knows where he is, not even her. 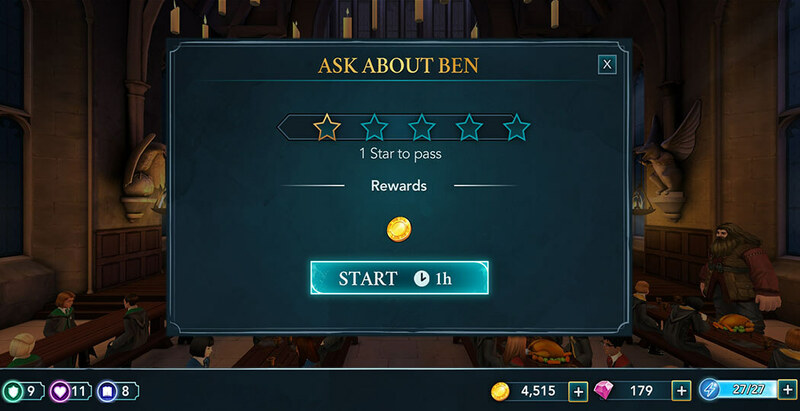 So, your next task will be to ask around the Great Hall if anyone saw Ben. 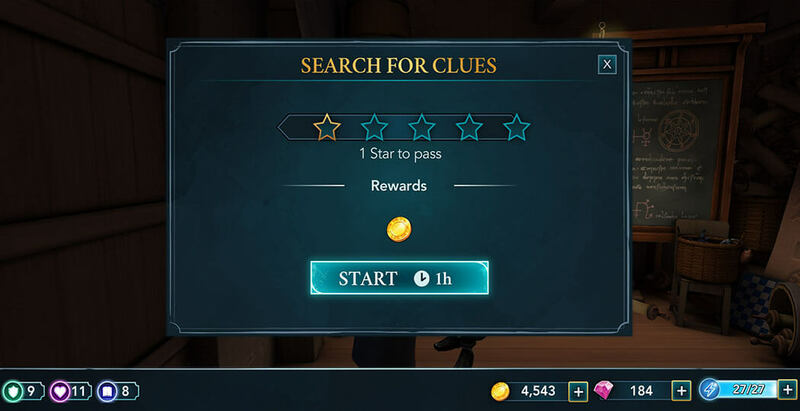 This task requires you to earn five stars within one hour, but in order to pass you only need one star, so it shouldn’t be too difficult to complete it. When you are ready, hit the Start button to begin. As usual, complete actions by tapping on the glowing objects. This will fill up the star meter. For this task, pick the actions with the highest cost in order to optimize energy usage. Not a single person knows where Ben is, by the looks of it. Penny will seem quite worried and will ask if you can think of anyone else that you can ask for help. 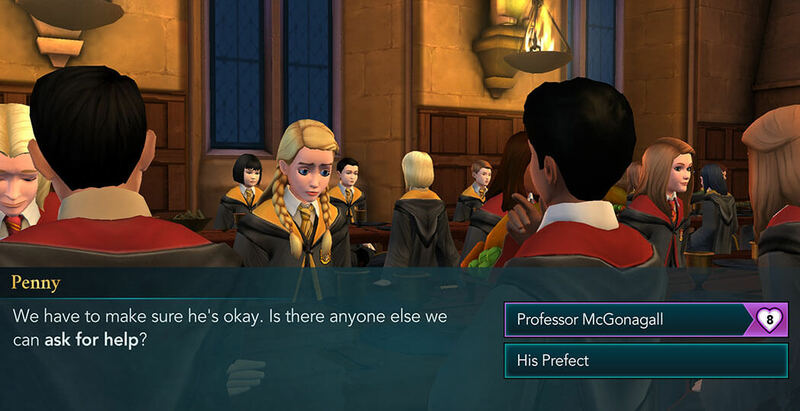 You have two options to respond with – Professor McGonagall or his Prefect. It is highly recommended to select the first option for two reasons. 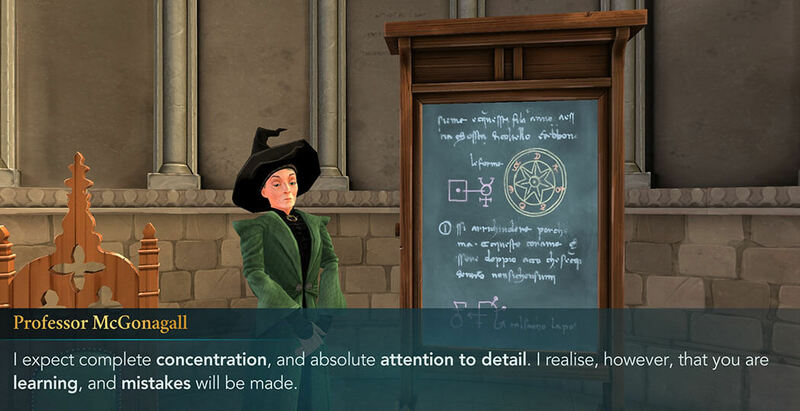 First, Professor McGonagall is a very knowledgeable person, and she might know some way to help. Second – this option will reward you with ten Empathy points, so it yields a greater reward compared to the other one. 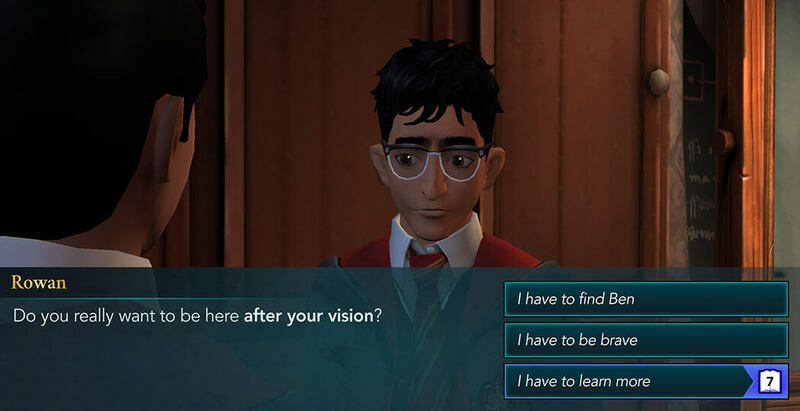 The only downside is that you need to have Empathy attribute at level eight in order to choose this option. 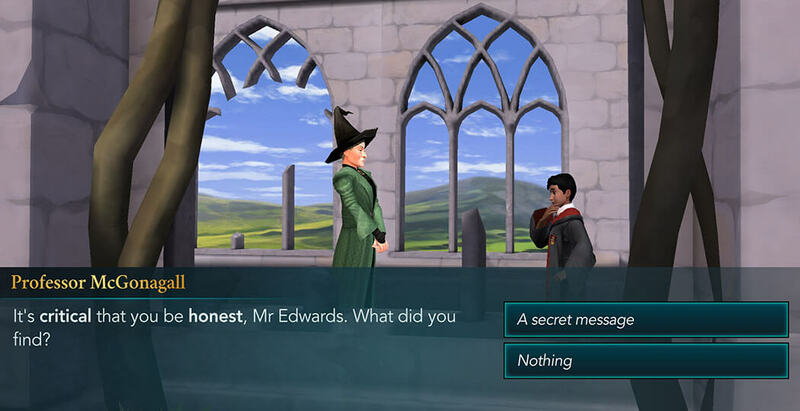 After a bit more talking you’ll decide to check whether Professor McGonagall knows anything that could help. Sadly, there is a three-hour waiting period before you can proceed, so you can either wait a bit or spend some gems to speed up the process. 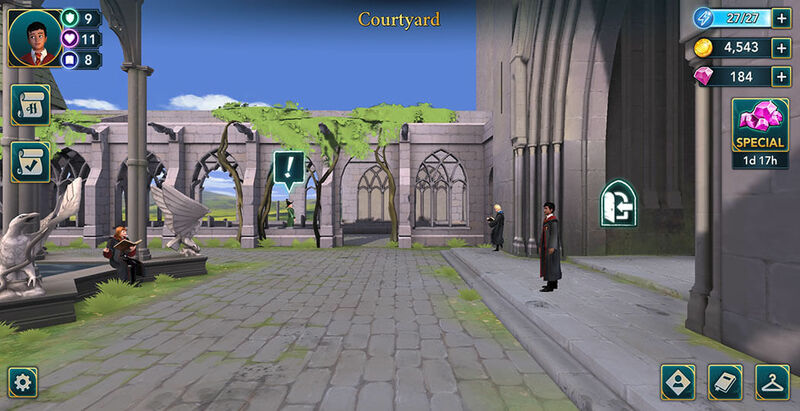 In any case, once you’re ready, hit the GO button to proceed to the Courtyard. 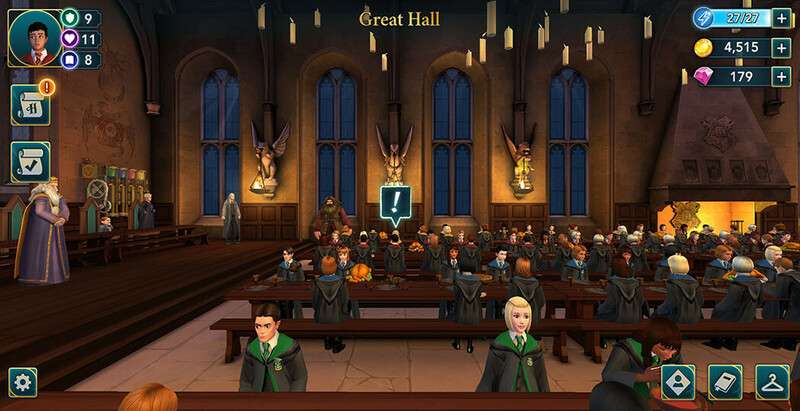 When you get there, you’ll notice that Professor McGonagall is already there. Tap on the exclamation mark to start the conversation with her. After a bit of talking, she will ask if you found anything when you visited the Mysterious Room last year. You can choose to tell her about the message on the wall or not. Each choice will award you with five attribute points. The recommended option is to tell her the truth since she could probably help you later on if you share this information with her. 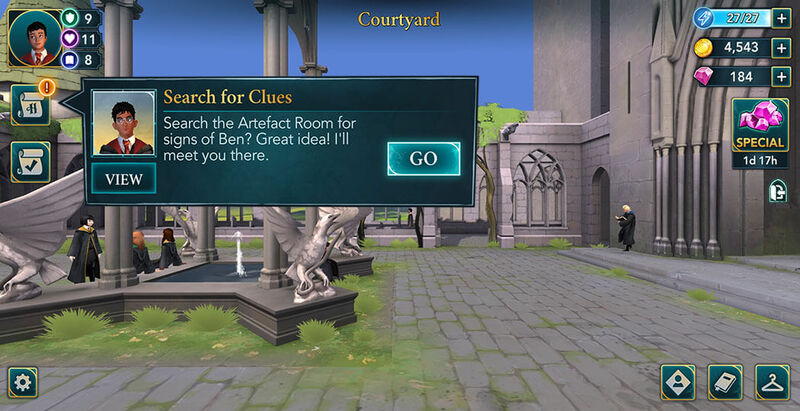 Afterward, she will suggest that you look at all the places Ben used to hide at Hogwarts, and hopefully, you might find something related to his disappearance. Also, she will want you to report back to her immediately if you find him. So, the most logical place you could search is the artefact room. Ben used to spend a lot of time there, and who knows, there might be some clue there. Tap on the GO button to proceed. 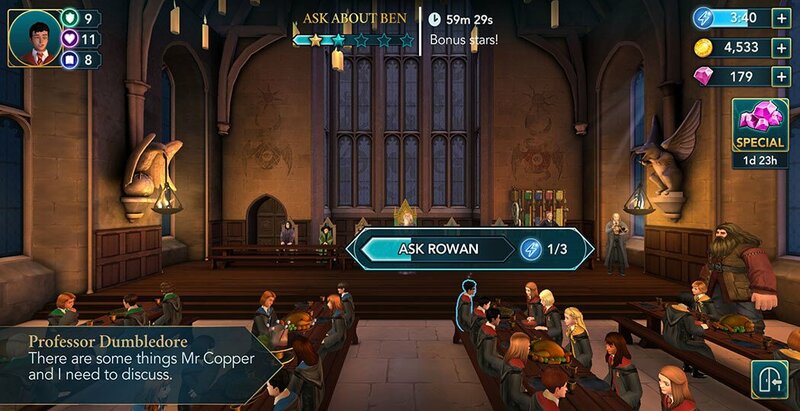 When you arrive, you’ll find that Rowan is there already. Tap on the exclamation mark to continue. You will recall that this is the spot you had your vision at, the previous time you were here. Rowan will ask if you are sure about searching this place. You have three response options. The first two option will award you with five attribute points. 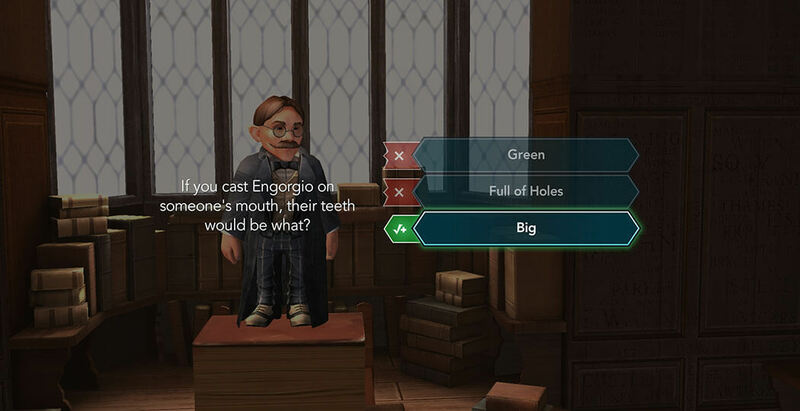 If you, however, pick the third one, you will earn ten Knowledge points, which is the best option here if your knowledge level is seven or higher. 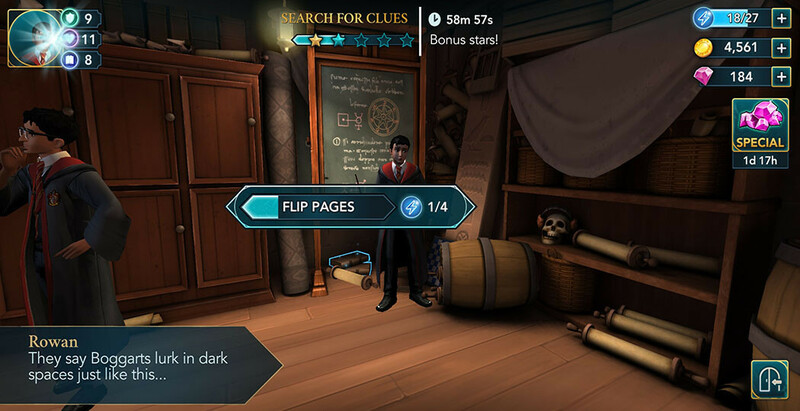 After a bit more talking, you will get the task to search the room. For this one, you need to earn five stars within one hour, but you only need one star to pass. When you are ready, hit the Start button to begin. This task is fairly straightforward. Simply complete the actions that require the most energy in order to optimize its usage. Once you are done, you’ll find a locked cabinet. In order to open it, you’ll need to use the Unlocking Charm. 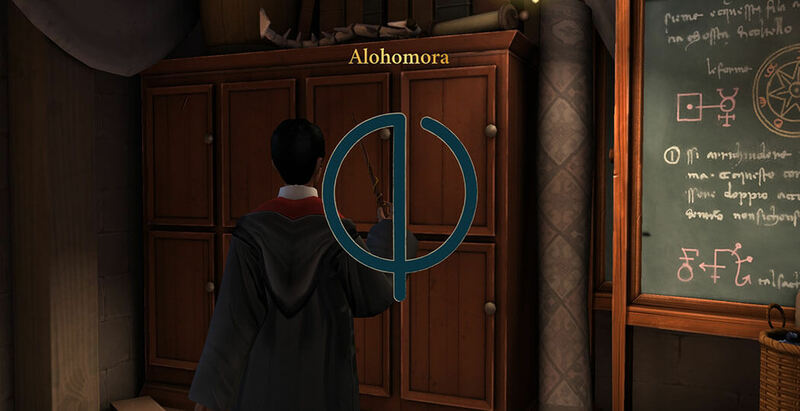 Trace the path on the screen to cast Alohomora. Inside it, you’ll find a message written in some kind of code. 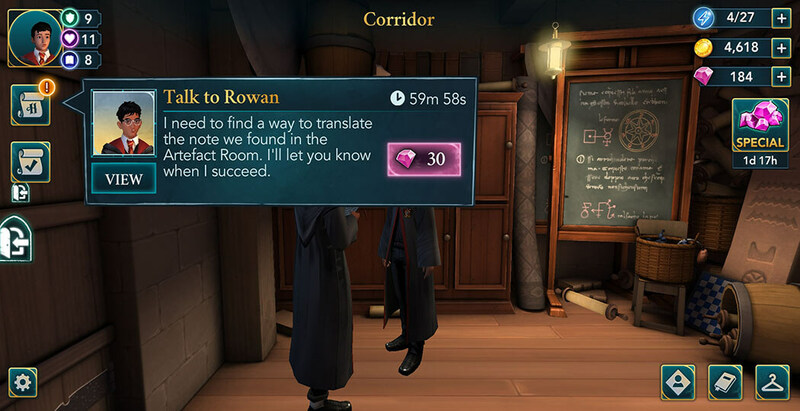 Rowan should be able to decode it, but it will take him some time. 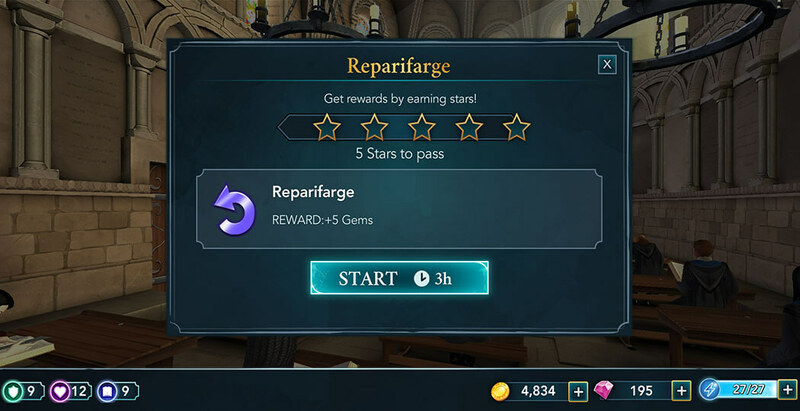 So, for the next task, you can either wait for an hour or use some gems to remove the waiting time. 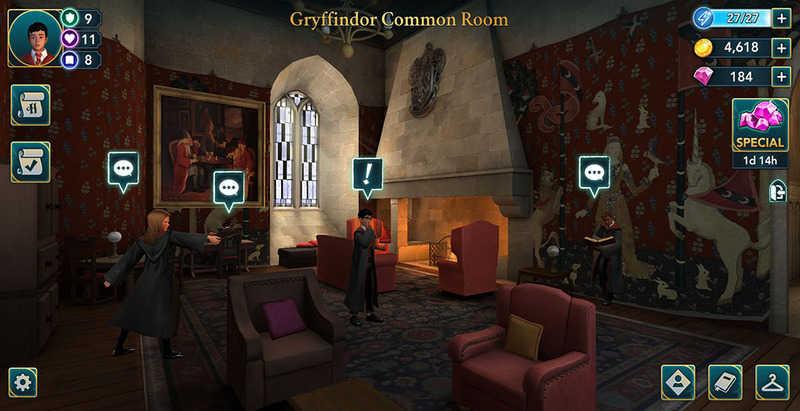 Either way, when you are ready, hit the GO button and proceed to your Common Room. Once you are there, you’ll see speech bubbles above some of the students. Tap on them to see what they have to say. After that, tap on the exclamation mark to start the conversation with Rowan. He’ll tell you that he successfully decoded the message. It says that the next instruction has been transfigured into a Black Quill, and hidden in the Slytherin Common Room (or Gryffindor Common Room if you are Slytherin or Ravenclaw). 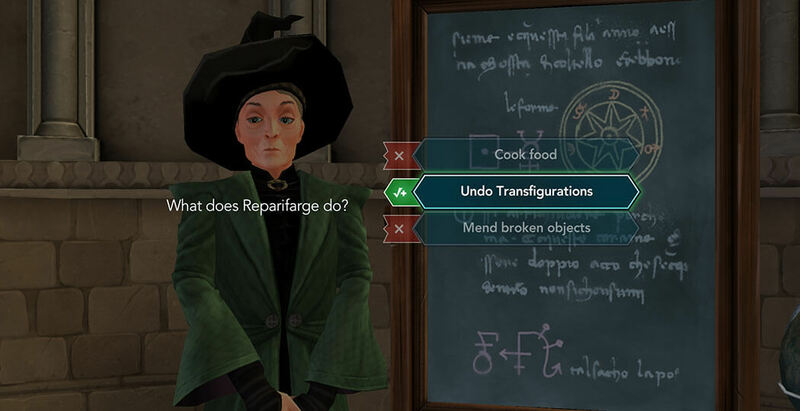 In order to undo that transfiguration, you will need to learn Reparifarge spell. Also, the letter is signed with R, but at this point, you have no clue who that might be. 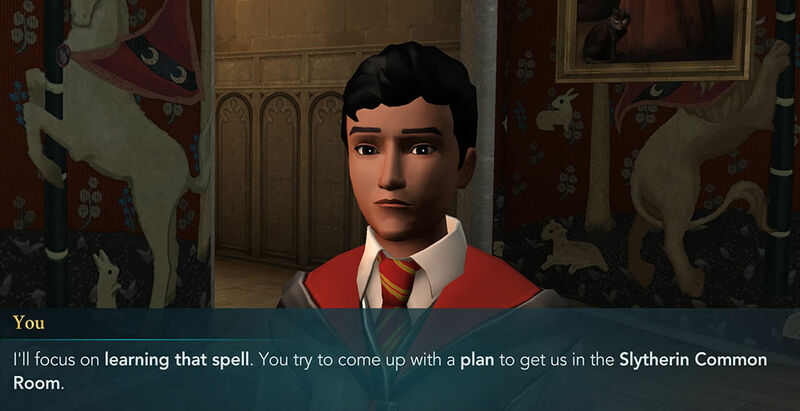 So, you came up with a plan to learn that spell while Rowan thinks of a way for you to sneak into the other house’s Common Room. 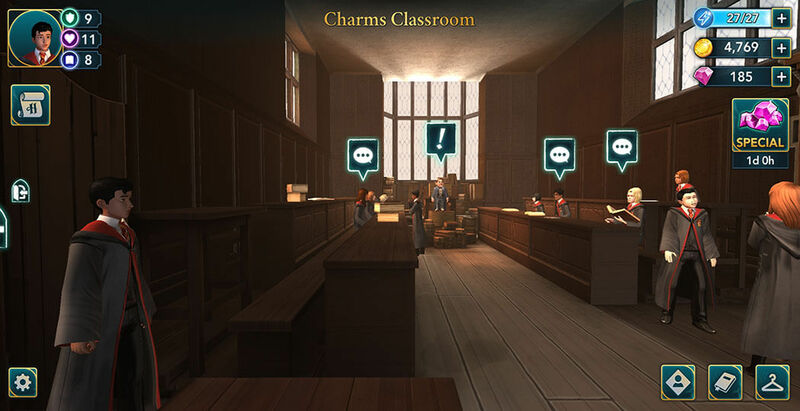 For the next task, tap on the GO button and proceed to the Charms Classroom. 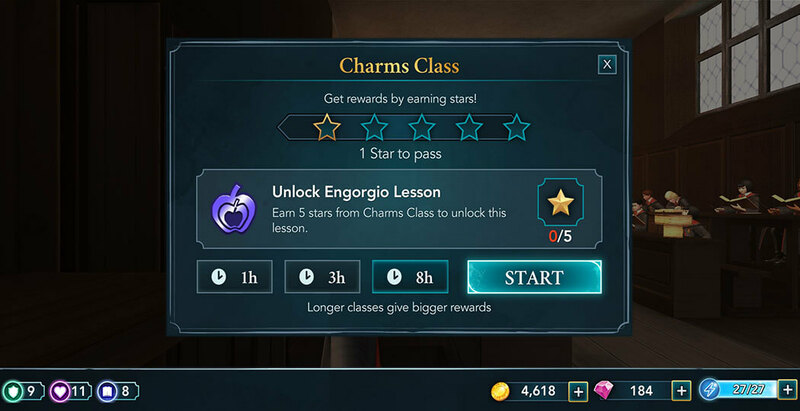 The next Charm spell you’ll be learning is Engorgio, but in order to unlock it, you need to earn a total of five stars from Charms Class. The most optimal way for that is to select an eight-hour class. When you are ready, hit the Start button to begin. 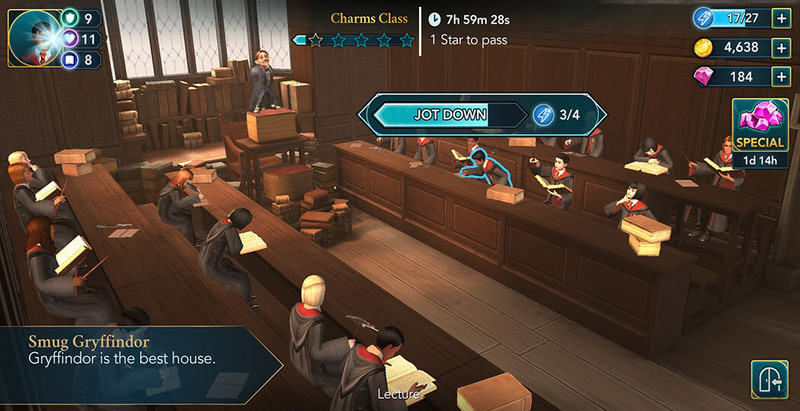 Same as with any other class, complete actions by tapping on the glowing objects in order to fill up the star meter and earn stars. Try your best to successfully complete mini-tasks since each of those will award you with ten Empathy points. When you are done, tap on the Collect button to continue. 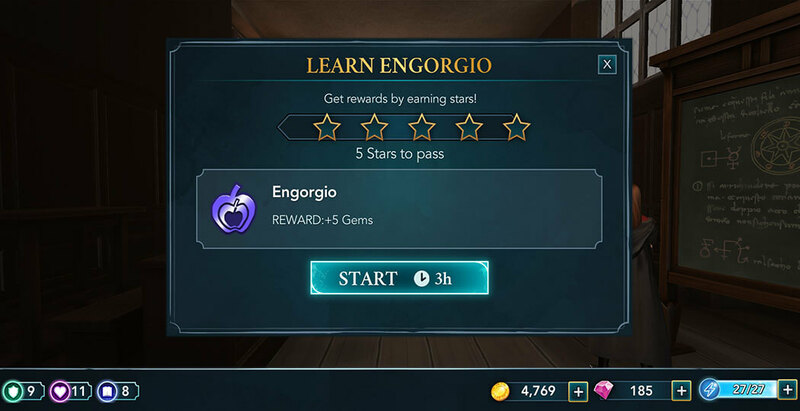 Engorgio lesson should be unlocked now. Hit the GO button to proceed. Once you are in the Charms Classroom, you will notice that some of the students have something to tell you. Tap on their speech bubbles to see what they have to say. Afterward, Professor Flitwick will hold a short introduction to today’s lesson. 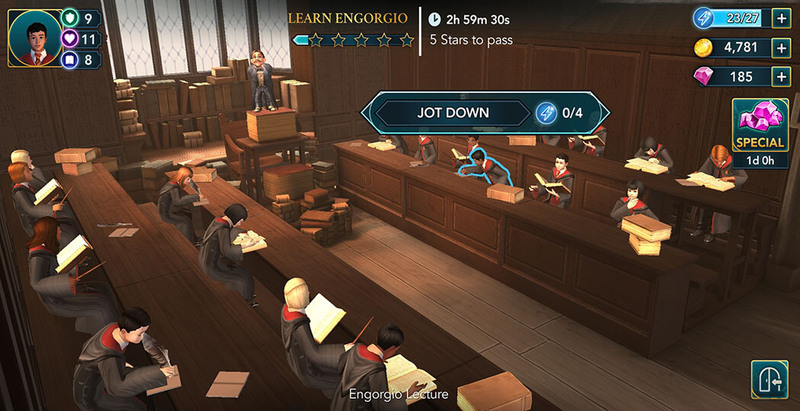 In order to pass, you need to earn five stars within three hours. It is advised to start at full energy, that way you won’t have trouble completing it in time. When you are ready, hit the Start button to begin. 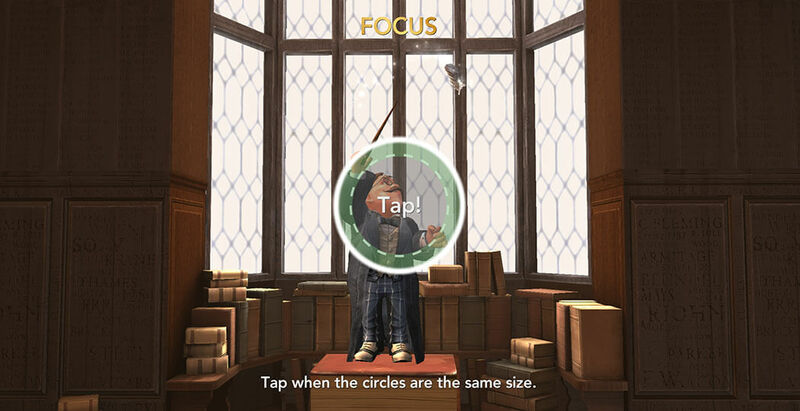 Like in all classes, complete actions by tapping on glowing objects in order to fill up the star meter. Pay attention to mini-tasks since completing each of those will award you with ten Empathy points. 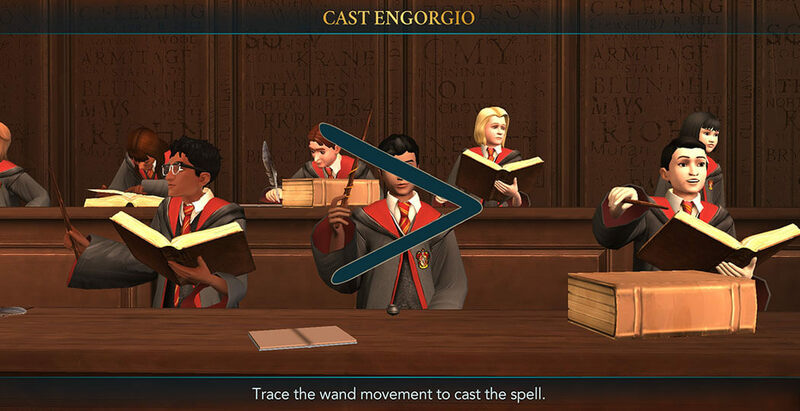 Once you obtain the fifth star, you’ll be tasked with casting Engorgio. 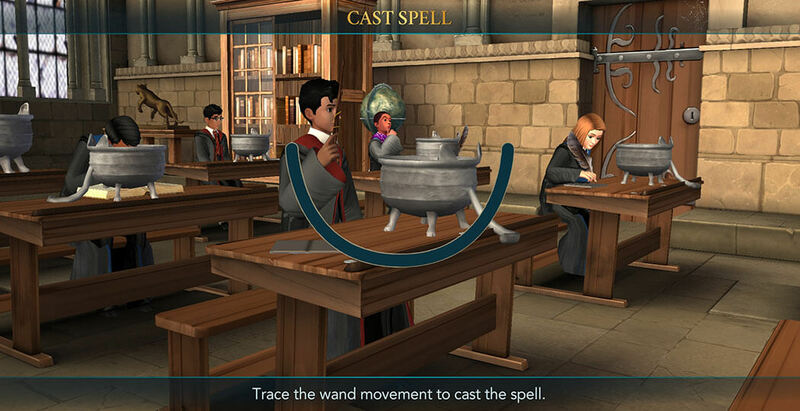 Trace the path on the screen to successfully cast the spell. Congratulations! You just learned your first spell for this year. Your next task will be to attend the Transfiguration lesson. Tap on the GO button to proceed. 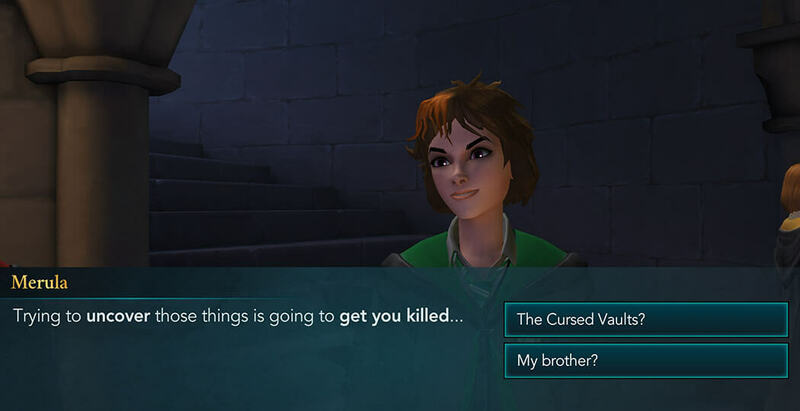 You’ll encounter Merula on the way, and after a bit of talking, you’ll be able to choose one of two options. Each of those will grant you five points in a different attribute, but no matter the choice, you won’t be able to gain any important information from her. Afterward, proceed to the classroom. When you get there, Professor McGonagall will hold a short introduction for your first Transfiguration class. 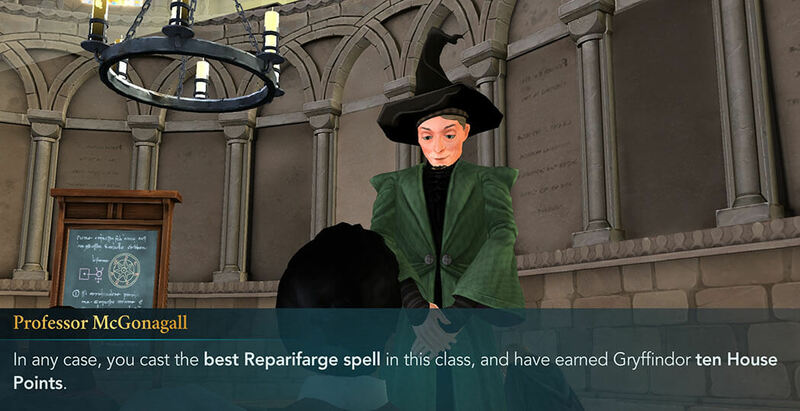 After that, she’ll demonstrate the spell you’ll be learning today – Reparifarge. Tapping on the exclamation mark will open the task window. To pass this lesson, you need to earn five stars within three hours. Therefore, it is highly recommended to have full energy prior to starting. When you are ready, hit the Start button to begin. This lesson works same as any other, complete actions, fill up the star meter, and earn stars. Also, try your best to succeed at mini-tasks, since you’ll get ten Knowledge points for each one you complete. After you obtain all five stars, it’s time to cast the spell. 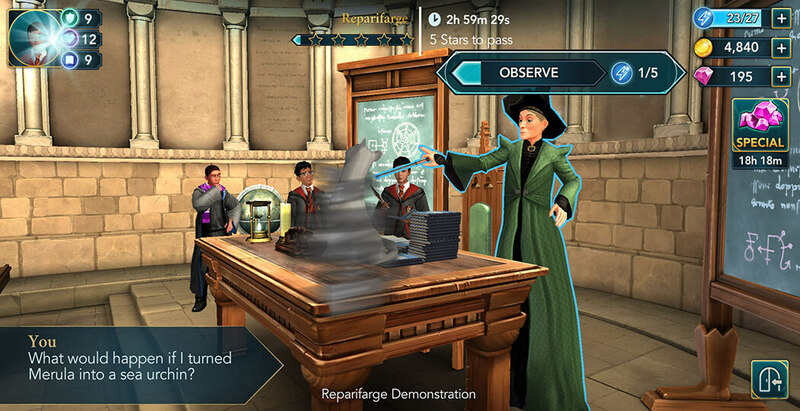 Trace the path on the screen to successfully cast Reparifarge. Congratulations! You’ve just learned your first transfiguration spell. It will, without a doubt, be useful in your future adventures. Tap on the Collect button to continue. 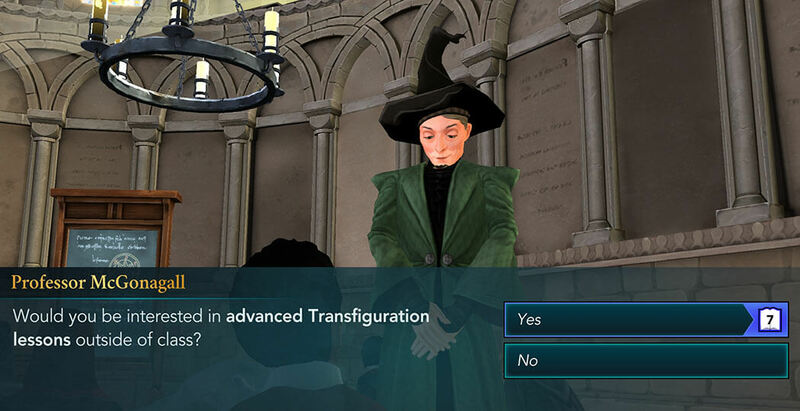 Professor McGonagall will be very impressed by your skill, so impressed that she will ask if you want to have advanced transfiguration lessons outside of class. 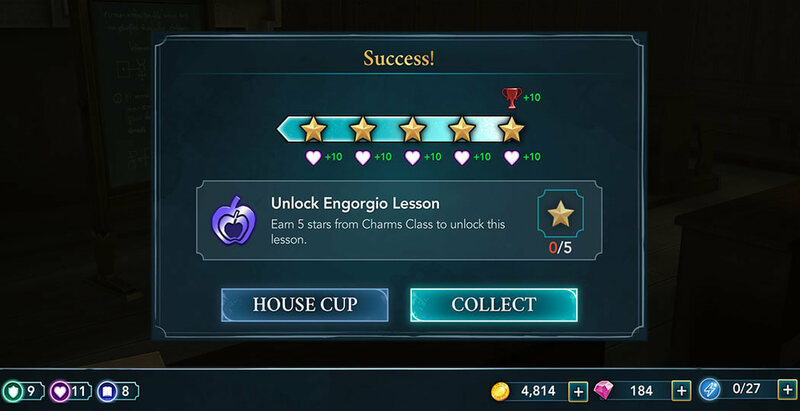 Accepting her offer requires level seven in the knowledge attribute, but this option is highly recommended since it will allow you to learn some additional spells later on. 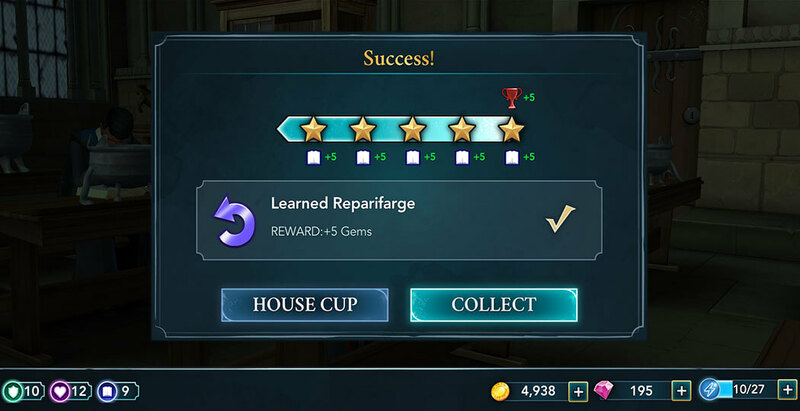 And that’s not all, because you managed to cast the best Reparifarge in class you will be rewarded with ten house points. And that’s it for Chapter One of Year Two of our adventure. 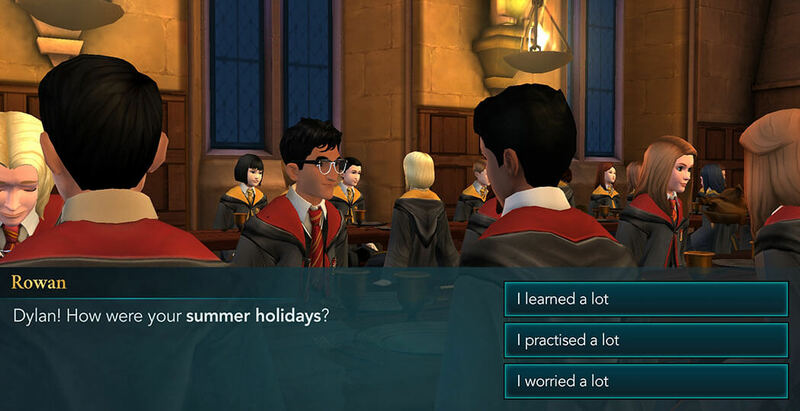 How did you like the beginning of your second year at Hogwarts? What were your favorite moments? What choices did you make? Let us know in the comments below. 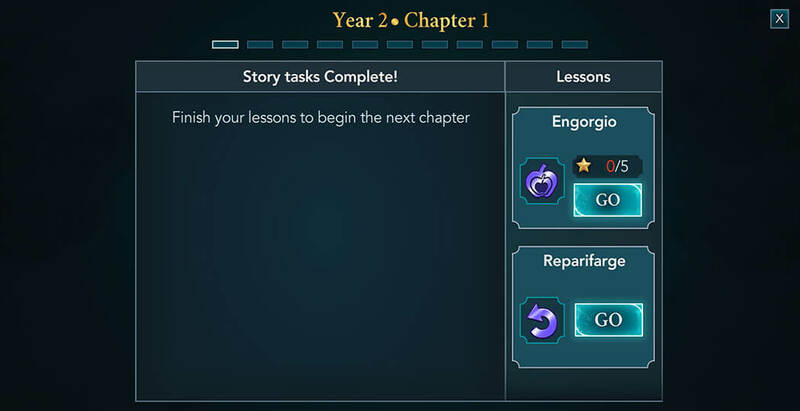 Thank you for reading and stay tuned for another Chapter of our Magical Journey Walkthrough for Harry Potter: Hogwarts Mystery.